There are just those days where we don’t want to spend a lot of time in the kitchen to prepare dinner. And in fact, sometimes we’re so lazy we don’t even want to cook! So contrary to popular belief, just because we have this food blog doesn’t mean we’re constantly cooking every day and having lovely home-cooked meals! I’m actually a big fan of quick cooking, so this recipe we created is perfect for that. For those who want to get rid of some ingredients in the fridge and want a nice healthy meal, this is for you! We are not exposed to a lot of Filipino food, so the only time we really get to eat it is when we make it ourselves, like the Chicken Adobo we made awhile back. 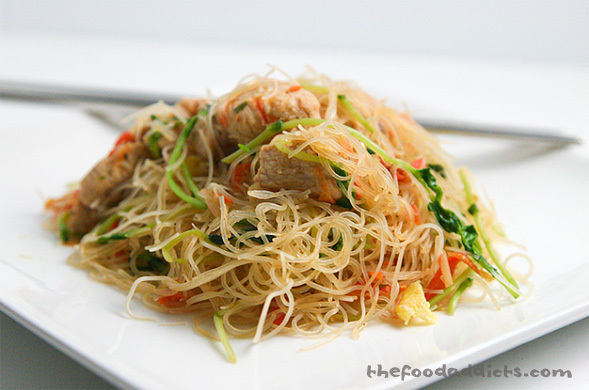 Pancit is basically Filipino noodles that is usually pan fried with soy sauce, citrus flavoring, sliced meat, and vegetables. There are a lot of variations, so we decided to make our own version with what we had at home. We used the Kikkoman lime ponzu sauce and soy sauce to flavor the dish, and added some chicken, carrots, and pea sprouts. Yes, pea sprouts. 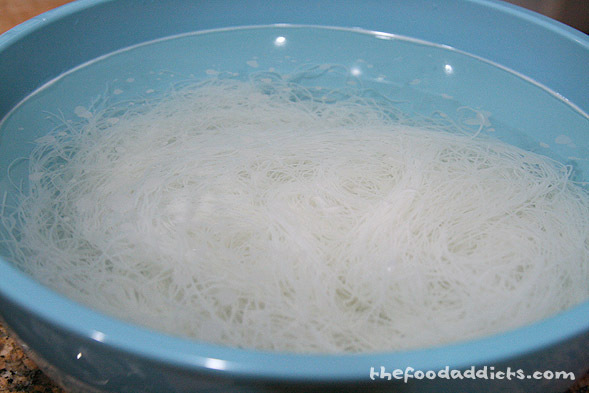 It’s actually really refreshing and tasty in noodle dishes! We bought an 8 oz. bag of pancit (ingredients are rice flour, cornstarch, and water), and we soaked it in warm water for about 15-30 minutes, until soft. 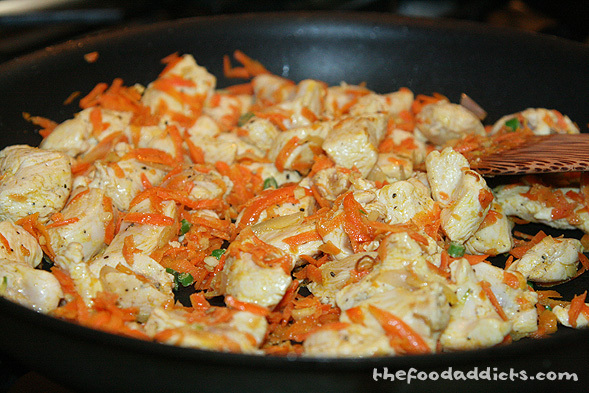 In a pan, we started by sauteing 3 minced garlic cloves, 1 large shallot, and 1 cup of grated carrots. Then we added 12 oz of bite-sized chicken pieces (we used chicken breasts). When the chicken is just about done, we added the noodles along with 8 oz. of pea sprouts and 2 scrambled eggs. To that, we seasoned the entire mixture with soy sauce and ponzu sauce. See how easy that was? Doesn't take a rocket scientist to throw some ingredients together to get a nice and healthy colorful meal. 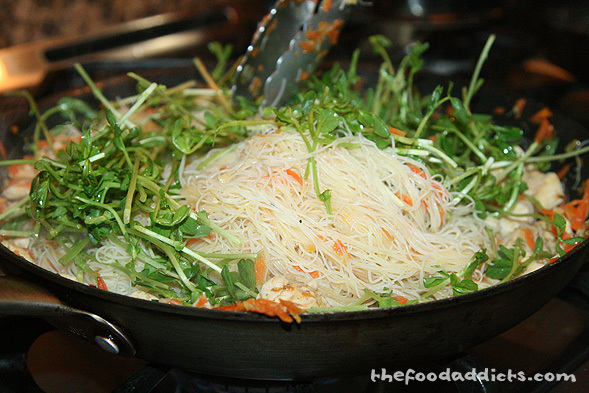 Pancit is definitely "something conveniently cooked fast."